Good review! The trailers for this film really have me intrigued and the chemistry between Downey and Law looks good. Can't wait! Nice observations here. 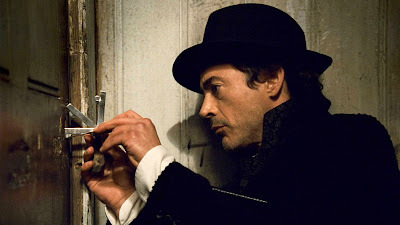 I enjoyed some of the same elements - I loved Downey Jr.'s performance and this new interpretation of Holmes, and I liked the fact that he could knock his adversaries down, but there were too many fist fights and they were too long. I would have preferred less fighting and more deductive reasoning of clues that don't get explained until the end - when it doesn't really matter. Along with Downey's performance, the sense of time and place - so richly portrayed - was a major strength here. Strangely, the previews don't reveal what the film is really like - which was actually a pleasant surprise. From the previews, I expected something lighter and less historically evocative - like the Banderas Zorro movies. A few minutes into the film, I was in a totally different world: dark, grungy, fascinating. I'm glad the movie didn't turn out to be like the previews. I've learned over the last few days that those who criticize the movie for not capturing the essence of Holmes know only the pop culture depictions of the character, since many details from ACD's original novels are peppered throughout the film. Yeah, maybe the fight scenes take precedence over the deductive work, but it is a Guy Ritchie movie. I admired how he honored the essence of Holmes while maintaining the auteurial flavor of his own work. I think the best direction for this to go in, should this become a franchise, would be to assign a distinctive auteur to each sequel. Holmes is such an iconic character, and the rest of his world is such a tabula rasa, that you could give each director the requirement that they preserve the character but everything else is fair game to tweak as they want. Sort of what they've attempted to do with the MISSION: IMPOSSIBLE series , but haven't quite succeeded at accomplishing. Very well said! 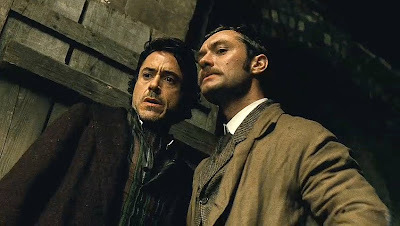 For much of the movie, I was starting to get the impression that it was more of Watson's show, and that Holmes was only there to steal his thunder. I really loved both Downey and Law in these roles, and thought they had fantastic chemistry together. My biggest qualm was only that the exposition of how Holmes was putting the case together was held back a tad too long...the big explanation at the end sorta made the film feel a bit like CSI, no? "My biggest qualm was only that the exposition of how Holmes was putting the case together was held back a tad too long...the big explanation at the end sorta made the film feel a bit like CSI, no?" You know, that didn't bother me too much. It seemed characteristic of what one expects from a Holmes story. But more importantly, the weak case was less of the attraction in this movie than the heavy focus on character and setting that really made the film so charming.